These Stuffed Apples with Crumble Topping are a simple, quick and healthy, yet satisfyingly naughty tasting. This easy crumble is a perfect dessert for guests, or as a one-person treat that doesn’t blow your diet out the window. Without the custard, you’re looking at just 212 calories per serving. You can prepare it ahead, or just make it and put it in the oven when you’re hungry. 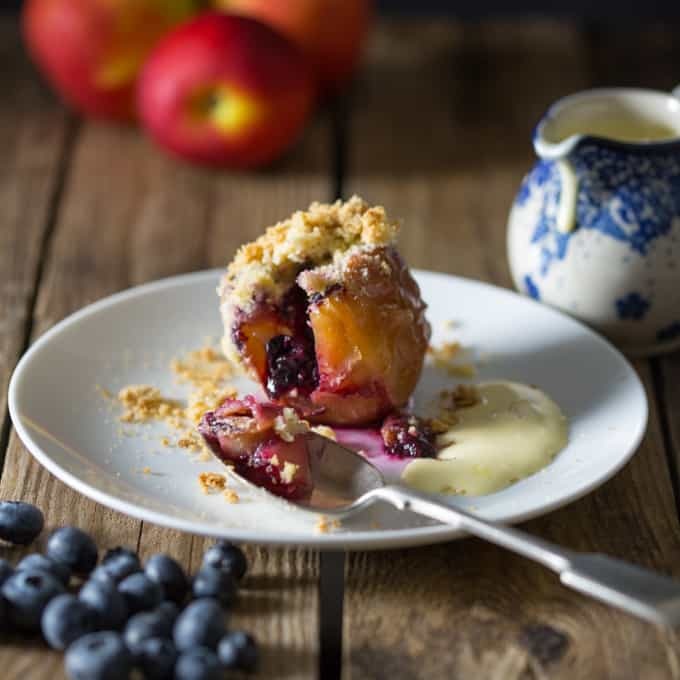 How about preparing this Stuffed apples with crumble topping for a weekend breakfast? You could top with a few oats, swap the custard for yoghurt – or just go ahead and have custard for breakfast. I won’t tell. I made this pud as a little treat that probably should have been enjoyed sat at the dining table over a leisurely chat. In all honesty, they didn’t even make it out of the kitchen. Chris and I just hunched over the kitchen surface and gobbled them up the moment we’d finished taking the photos. One of the (very few) disadvantages of blogging with food is having to adjust your palate to luke-warm food. So my excuse is that they simply needed eating as quickly as possible! 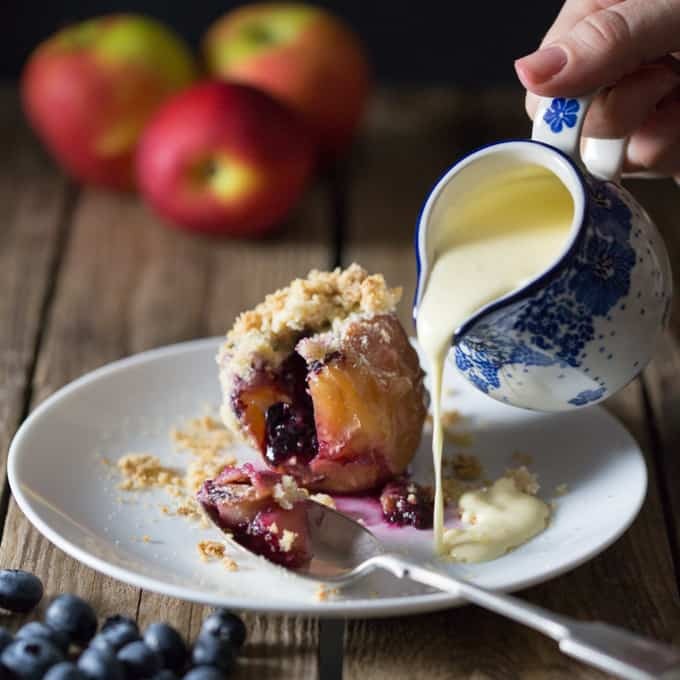 For this easy Stuffed apples with crumble topping dessert, you’re going to carefully hollow out some apples using a sharp knife. It’s important to not to cut out the bottom of the apples – otherwise you’ll just have some sad looking apples sitting in a blueberry bath by the time you take it out of the oven. You need the apple to act like a kind of bowl. It’s a little tricky, but easier once you’ve done the first one. 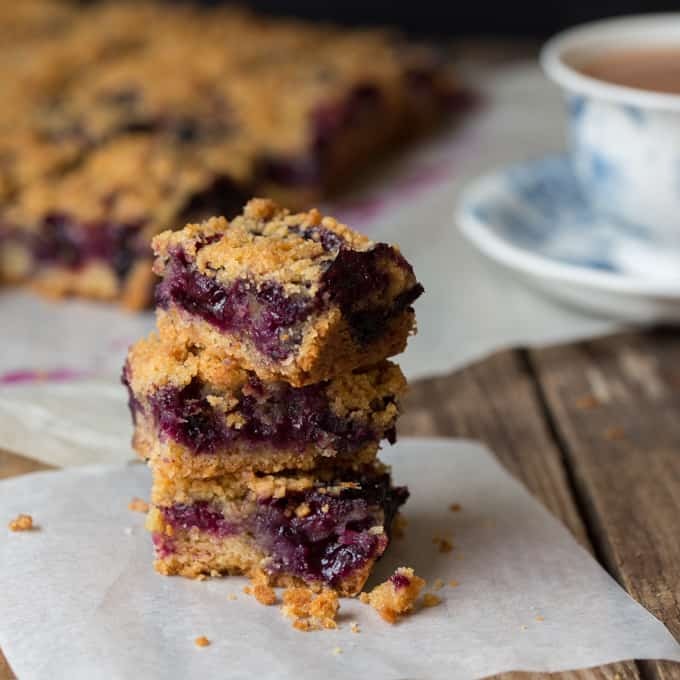 The hole needs to be about 3.5cm-4cm across so you can fit in plenty of blueberries – and also to ensure you have enough surface area to top with the crumble. Once you’ve hollowed out the apples, brush the insides with some lemon juice, This is particularly important if you’re preparing ahead – to stop the apple going brown. 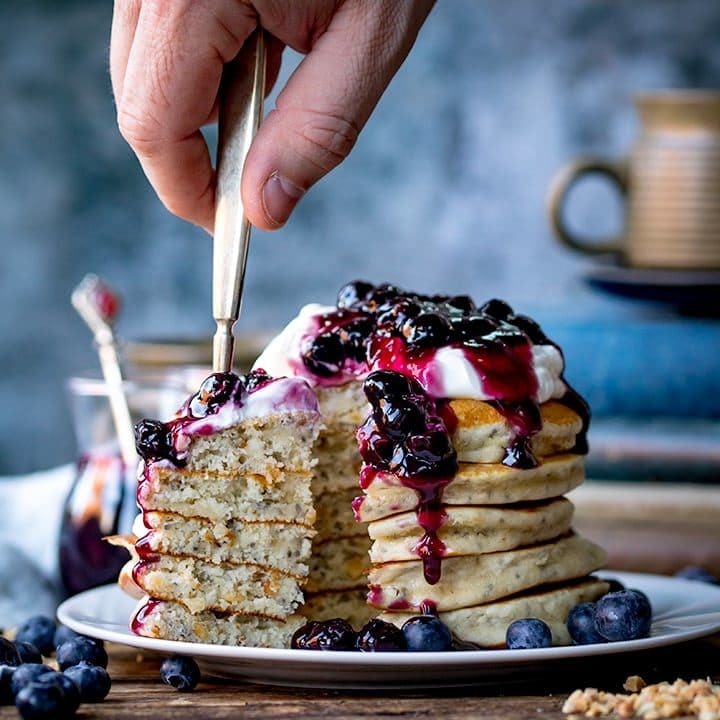 The filling itself, is a combination of blueberries, sugar for a bit of sweetness, and a little cornstarch to help thicken the filling slightly during cooking. The crumble topping is a regular mix of butter, sugar and flour, but you can also add nuts or oats or demerara sugar if you wish. I made my own custard for this. If you’ve never made custard before, give it a go. It’s surprisingly easy. I’ve included instructions for this, and also the nutritional info for the apples with and without the custard. If you love crumble recipes like I do, check out my cherry crumble cake or apple crumble cookies. These Stuffed Apples with Crumble Topping are a simple, quick and healthy, yet satisfyingly naughty tasting. 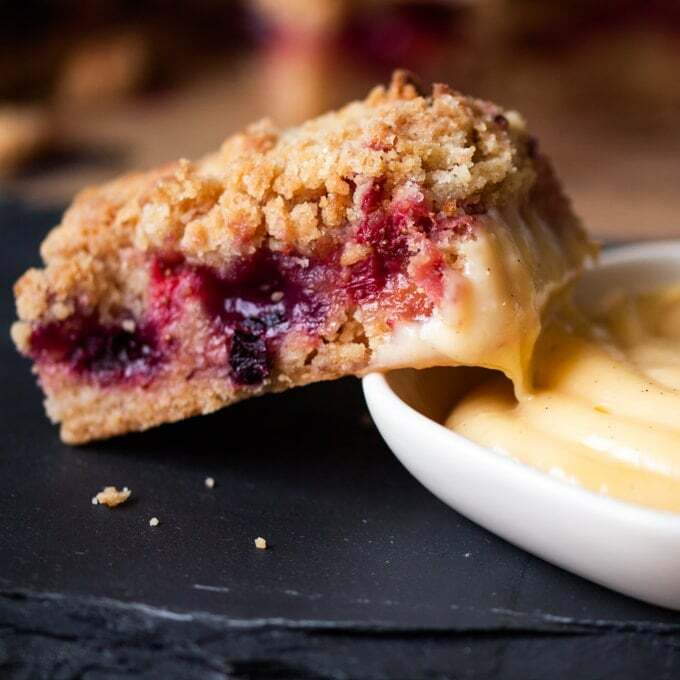 This easy crumble is a perfect dessert for guests, or as a one-person treat that doesn't blow your diet out the window. Without the custard, you're looking at just 212 calories per serving. You can prepare it ahead, or just make it and put it in the oven when you're hungry. Hollow out your apples (leaving the base of the apple intact) and brush the insides with the lemon juice using a pastry brush. In a small bowl, mix the blueberries, sugar and cornstarch. Spoon this mixture into the apples. It's ok if the blueberries stick out of the apple a little. They'll breakdown and sink a bit when they're cooking. Next make your crumble topping. Place your butter and flour in a bowl and rub the flour into the butter using your fingertips until you have breadcrumbs. They don't have to be too small, a few bigger lumps in there adds to the texture of the crumble. Stir in the sugar, and then spoon this crumble mixture over the top of the apples. If you have any extra crumble, you can either freeze it, or you can make it on a tray along with the apples in case anyone wants extra. Place the apples in the oven and cook for about 25-30 minutes - until the crumble starts to go brown. Whilst the apples are in the oven, make your custard. Heat your cream in a pan until scalding (don't boil it though). In a jug, mix the egg yolk, cornstarch, sugar and vanilla extract. When the cream is scalding, pour into the egg mixture in a thin stream whilst whisking all the time (if you pour it in in one go, the egg will just scramble). Once mixed together, pour back into the pan (use a clean pan if your pan has a layer of cream stuck to it), and continue to stir the custard with a whisk over a medium heat until it thickens. If it gets too thick, you can add a touch more cream. Turn off the heat. Just before your apples come out of the oven, reheat the custard, giving it a good stir and adding a touch more cream if required. Serve your stuffed apples with the custard. Nutritional info obtained from caloriecount.about.com – per serving without custard. These must make the whole house smell awesome! Happy FF! A fantastic dessert for the season! I love the flavours and beautiful photos. Love it Nicky, perfectly light and delicious. The custard is lovely with the apple. 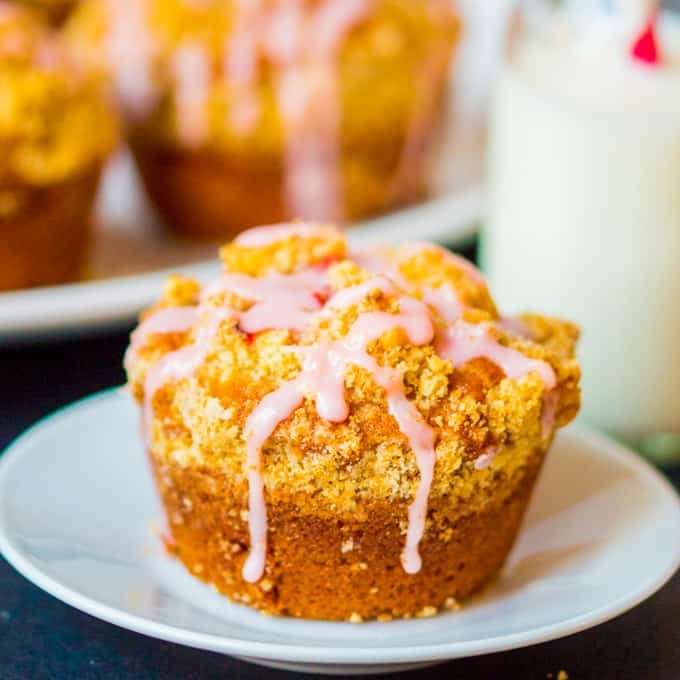 Ohhh fall is here and this is just perfect brunch! Wow, how absolutely delicious this looks and I’m sure tastes too. Love all the fall fruit entries. Fall on a plate…gorgeous. I love the combination of your flavors! Thanks Julie 🙂 Love your almost no-knead bread btw! Will be trying that this weekend! Nicky, these stuffed apple crumbles look so delicious! I have one of these coming up soon too. They’re just so perfect for the fall. Thanks for sharing with us at Fiesta Friday! These stuffed apples look seriously delicious…such a simple, easy and delicious recipe. I must try it! Thanks Thalia, they’re really too easy, I’m glad they’re pretty low in calories that’s for sure!! Nicky – these look adorable!! Love the blueberry stuffing – great idea and with yoghurt it is practically breakfast!! Thanks for sharing these with us – Happy Fiesta Friday! Love this! And love that picture of you pouring the cream! That’s just lovely light. What a beautiful fall shot.